You know what the best part of working is? Working together. Looking for ways to establish your brand and create meaningful connections can be daunting. But reaching out to people you can collaborate with is truly rewarding. 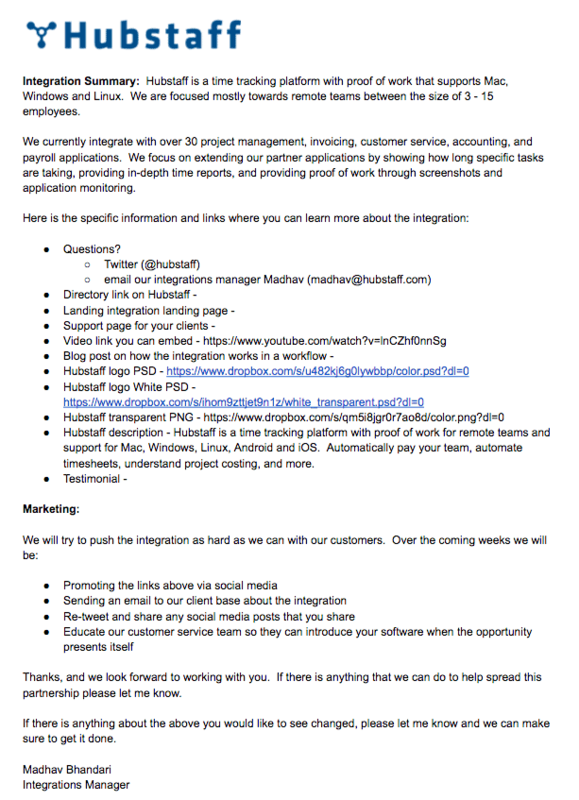 Here at Hubstaff, we’ve experienced that firsthand through creating close connections with our integration partners. Not only has it brought a lot of benefit for us, but it has truly made our work more meaningful. Why did we decide to build an integration plan? Why would you need one? Well, because in efforts as big as this one, you need a clear strategy and smooth steps to follow. That’s how you set the stage for real growth. But there’s a special story here. It’s about the relationships we’ve built with our partners. They’ve all proven truly fruitful in the long term, and we wouldn’t give them up. To share the knowledge and experience we’ve gained, I’d like to take you through our process of working with integration partners. The tips and good practices we’ve discovered are all here to help you out in creating your strategy step by step. A quick step back: how does Hubstaff work and how do integrations fit into our app? You might as well think of Hubstaff as a ‘hub’ of apps to manage your workforce. It integrates with more than 30 important work tools like Trello, Basecamp, Freshdesk, as well as with payment portals such as PayPal and Payoneer, so companies can easily pay their employees. To build on top of the existing apps in their workflows, we provide time-tracking and automatic payroll, so taking care of business has never been easier. Our ultimate goal to build integrations is to make the user experience for our customers seamless. Click To Tweet They can use Hubstaff without having to switch from the tools they are using already. Easy for people, smooth on our side. Building an integration with your app is only the first step. This opens up a number of opportunities for building meaningful relationships and expanding your brand’s audience. Here is what we did to discover the full potential of our partnerships with integrated tools. Once you’ve created an integration and it goes live, it’s time to think beyond the apps. Click To Tweet Your integration partners have audiences of their own. It’s quite likely that you can attract plenty of new customers from them. So, how do you make this new relationship work for you? The first step that you can take is to get your app listed on the partner’s marketplace, if available. Integration marketplaces are some of the most visited pages. Being featured there can bring you a steady flow of new customers with minimum effort on your side. That’s what we call a low-hanging fruit – and that’s exactly what we did. Besides that, getting listed means that you get a valuable backlink (from an SEM perspective), which is great if you want your integration page to rank for a target keyword. If you’ve gotten a listing in your partners’ marketplaces, what’s next? Well, it’s time to invest in your long-term relationship. It does take time to build it up, and it should never be a one-way street. Both partners should feel they’re getting somewhere, together. Whether you’ve already been featured on your partners’ marketplaces or not, a crucial step you need to take is creating strong connections with your partners’ teams. When you reach out and create bonds, your partnership can move to the next level. Building the right relationships starts with creating a list. As simple as that. Here’s how ours looks. By having all details about the contact people, channels of communication and the status of the partnership, it’s much easier to stay on top of our relationship-building efforts. The partnership list is our go-­to document for establishing a contact with our partners’ teams and getting listed on their marketplaces and integration pages. Once the first contact has been made, I have a special ritual to follow. It’s important to arrange a call with the partnering team, but not just to talk business. The purpose of this friendly meeting is to introduce both teams and start building the mutually beneficial relationship. That’s how people can get to know each other and understand better the issues that the other team is handling. It’s also an effective way to perfect integrations on the basis of user feedback and good collaboration between teams. 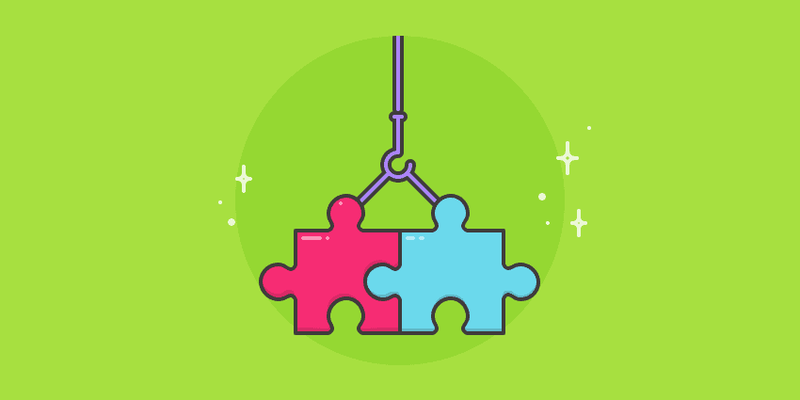 The next step in forging close connections with your partners is building a co-­marketing “package.” This allows both teams to consolidate their efforts and make something useful together. You can check out a package that we’ve used here. While it’s a bit old now, most points it contains are relevant even today. A great example of co-marketing comes from Zapier. It can serve as an inspiration for your efforts too. As here at Hubstaff we recognize the importance of our partners for our development, we take every opportunity to show how we feel. Here are some of the ways in which we invest in our relationships with integration partners. We’re happy when our partners progress and we don’t miss the opportunity to congratulate them on the big success soon after. Showing that we care makes our connections stronger. It also helps keep our brand in the minds of our partners’ teams. This, in turn, makes it easy to build a solid relationship. There will be a hundred other apps that would want to get listed on a popular app’s marketplace, such as Basecamp or Trello. To stand out, it’s best to continuously engage with your partners. It takes effort, but it’s definitely worth it. For example, I congratulated Payoneer when they acquired a new startup in early 2016. 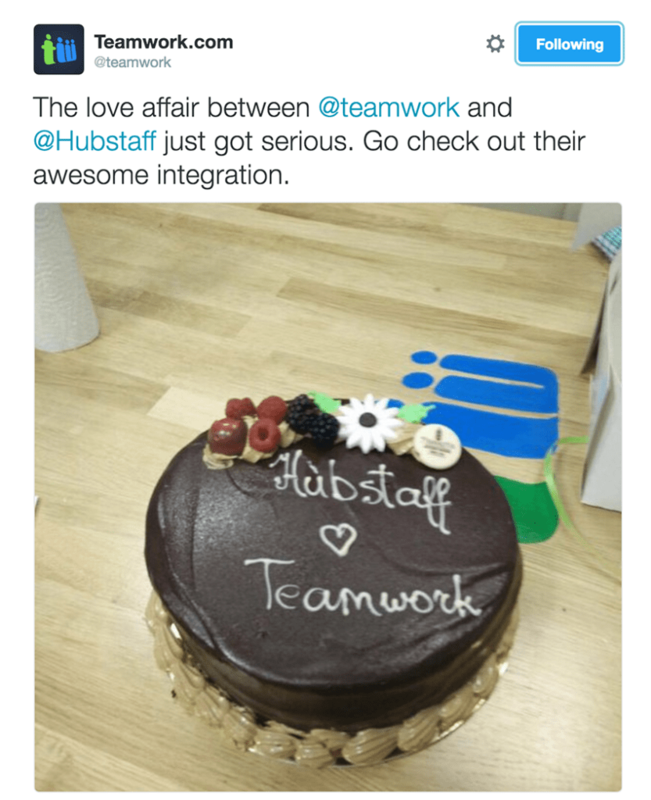 Our partners moving ahead is a case for celebration for Hubstaff too! Another great thing we like doing is showing our partners how much we value them. Handwritten notes and cakes are the best! Here’s what we did for our good friends at Teamwork. Chocolate cake just wins! That’s how we show we thank people and show them our appreciation. The same story with our partnership with Asana. 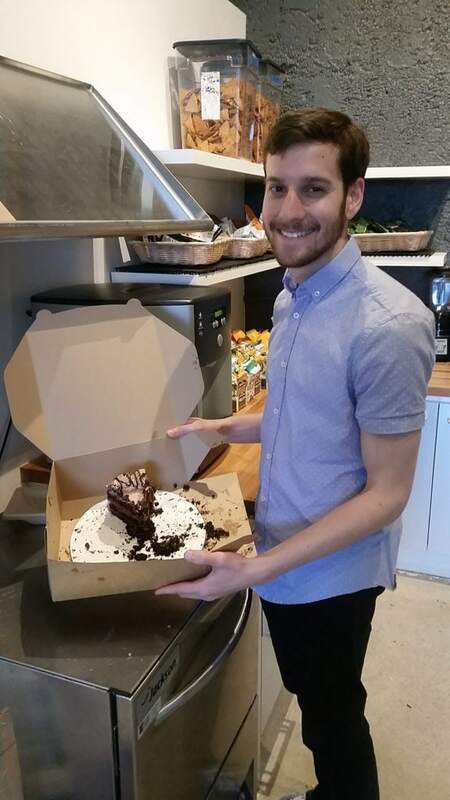 You can see Daniel from their team relishing the last bite of the cake we sent them! Another awesome way to pay it forward to your partners is to help create value for their own customers. 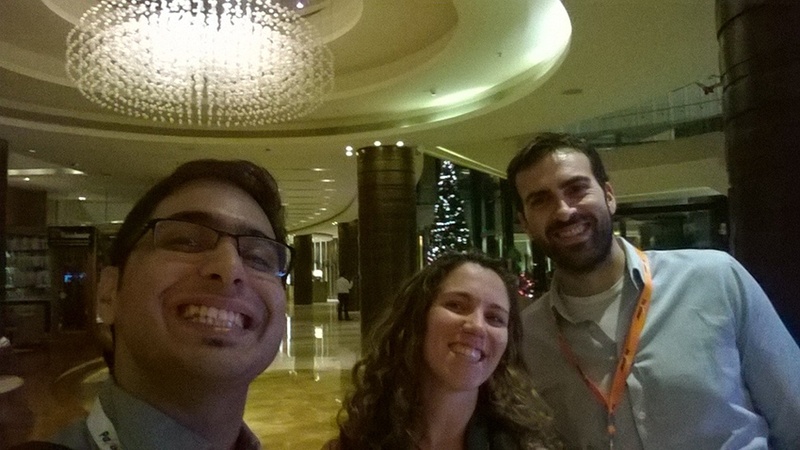 Last year, Payoneer had a conference for entrepreneurs, consultants, and freelancers in Bangalore, India. They invited us to share our experience on managing a remote team. I felt this would be a perfect opportunity to provide them with a glimpse into Hubstaff’s team and processes. So I traveled there to speak at the event. Besides my participation in the conference, it was a great chance to meet with Payoneer’s team personally. We had good times with Adam and Keren from their partnerships team. I even managed to have a brief conversation with Payoneer’s founder Yuval Tal. Such meetings help strengthen existing relationships. This is of great help in planning roadmaps for our common integrations. That’s how we can make them better and more useful to our customers. Here at Hubstaff, we love useful content. One of the smart ways which we found to create value for our partners is by creating articles targeted specifically at their audiences. You can see our post about Basecamp’s features that might not be so well-known and another one on how we use Trello in our marketing team. There is one more way to leverage the power of content for your relationships with integration partners – guest blogging. It’s a handy way to share meaningful business lessons with your partners’ readers, creating value for them and visibility for your own brand. This is one of the practices we’ve used in our own partnerships. We’ve already created a special post for Freshdesk’s blog, telling our story of how we reduced churn through time analysis. We have upcoming guest posts for Redbooth, Trello, and Payoneer too (so stay tuned). What do we offer to our new partners? Partnering with Hubstaff is a useful opportunity for startups in need of visibility. We present them to our community in all possible ways – to our user base, blog audience, and subscribers list. And it’s a win-win for all! Sharing our process of working with integration partners is special for us because these partnerships are one of the biggest drivers of growth for Hubstaff today. We get about 5­-10% of our customers each month from this strategy. Your integration partnerships strategy requires low investments and brings truly high returns. In our case, we believe in boosting our efforts with activities that are proving beneficial for us at the moment, and this channel shows great promise. We are already at a phase where we’ve executed most of the tips that I shared, with all our integration partners. We’ve just started the second phase of our strategy, which builds upon leveraging relationships from our partners’ communities. I can’t wait to share it with you! I’ll do so in the coming months whenever I have some numbers to show. Our integration partners process that I just revealed can be of great benefit for your own efforts in forging meaningful relationships with the companies that you collaborate. What’s your experience? What are your best tips for building relationships and making the best of them?